The Horror Digest: Freaks: That'll Teach You To Marry Midgets! 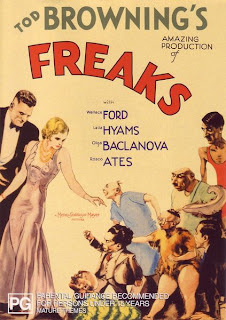 Freaks ranks among one of the most controversial films to date because of the usage of real circus "freaks" in the film. 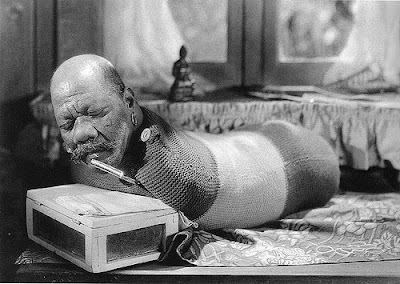 At the time, parading around people with deformities next to "normal" people and then subjecting the public to view it on film was a horrendous act-more horrendous than calling people with deformities freaks I guess. Sad though it is, the final scene in this movie landed it at #15 on Bravo's scariest movie moments list. The film is short- just about an hour long and tells the story of a band of circus freaks, who unite to seek revenge on a woman who had plotted to kill the leader of the performers and take his money. Cleopatra is a trapeze artist, cleverly nicknamed the flying peacock. She is courted by a sideshow midget named Hans and soon learn he has a large fortune. Plotting with her lover Hercules, Cleo marries Hans then tries to poison him. When the other performers learn of her plans they confront her and chase after her one stormy and rainy night. 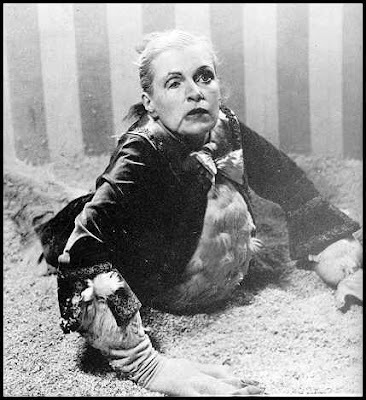 We soon learn that the freaks have turned her into a human "chicken" and now she is on display as a sideshow exhibit, looking like this. I guess what made this scary to most people were the freaks, but now nothing really can shock us anymore so the film is a bit dated. I still think the last scene is pretty darn good though, and call me crazy but seeing a bunch of legless and armless people, pinheads, and human torsos runing after you with knives is a bit scary. I love this movie so much. Although I think it has less to do with the shock value of it but the sense of the idea of outsiders banding together to protect each other. I think as horror fans we tend to be outcasts of sorts so I always felt that was a strong underlining as to why a lot of horror fans are big fans of this film. The negative was destroyed at the time but luckily a print showed up in the 50's and played at festivals where the film was really discovered. Luckily that print survived or this film would not exist today. Much like Lon Chaney's London After Midnight which is believed to be lost forever. Haha thanks! It surely is a fantastic coincidence! Try watching this movie again not as an exploitation piece, but as Tod Browning's ode to circus performers as well as a work of Horror ahead of its time. There's a wonderful dichotomy between the inclusive and alienated "freaks" and the exclusionary and prejudiced "normal" people (which reflects audiences' aversion to the "freaks" onscreen). Thematically Freaks has a lot in common with Brian De Palma's Carrie, where the real monster isn't the proverbial "other", it's "us".